Hi there! My name is Elizabeth. I am a retired teacher, Gramma to four ranging from 19 to 1. I love to sew, knit, crochet, smock and craft. This is a blog about my sewing and crafting exploits because it gives me a place to keep a record of projects and my 91-year-old parents can see it online. I'm not sure anyone else would be interested. My grandmother taught my to sew when I was about 10. Her sew machine was always going with six granddaughters to sew for. A thought that just occurred to me....we all turned out to be creative in different areas.....one knits lovely things, one makes beautiful pottery items, one is very musical and plays in a city band, one weaves gorgeous things on her loom, one is a creative problem solver and one sews little things and makes crazy projects (that's me). Anyway, after working my way through various crafts over the years, including the above-mentioned and cross-stitch, tatting, beading, painting and a feeble attempt at scrapbooking, I have settled comfortably into sewing things for the the newest addition to our family, Baby Mackenzie. I make things for her for three reasons: 1) I love doing it; 2) she doesn't complain about the style or color; 3) she has to wear it if I put it on her. Generally I follow a pattern to sew things, but I do have a few breakout creative moments and come up with something original, like the pumpkin-carriage stroller costume for Halloween....but that's a blog for another day. 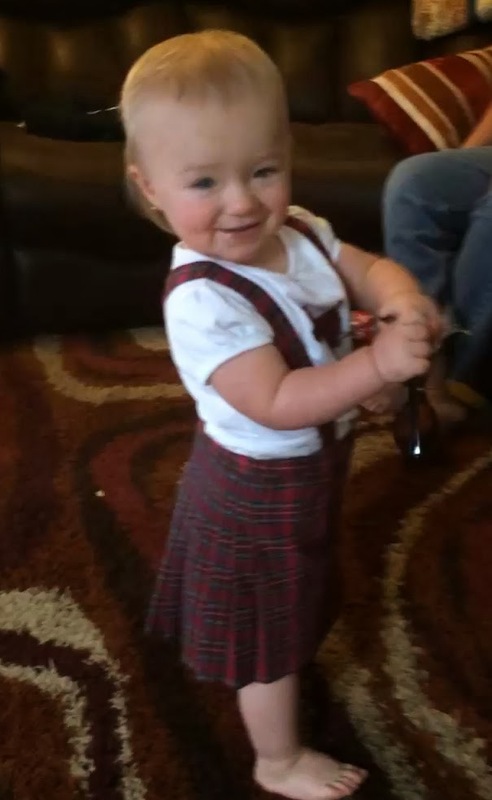 Today's blog is about one of my favorite projects, Mackenzie's Kilted Skirt. One has to call it a kilted skirt, because traditionally, females do not wear kilts. I read some tutorials on kilt-making and decided to give it a go. Being somewhat hesitant in my kilt-making abilities, I decided to skip the $25-a-yard wool and used a plaid flannel fabric instead. And, no Dad, it's not a Fraser tartan, either. It came out pretty cute, if I do say so. If I ever make another though, I will definitely heed a tip I read...DO THE HEM FIRST! I was so into pleating the back, I neglected to do that, much to my later regret. I used hook-and-loop closures on the waist band, but it wasn't quite tight enough to keep the skirt from slipping down her baby tummy so I added some snap-on straps. Here she is in her completed outfit. The white t-shirt is from Walmart. I fused an applique of a scottie dog to the front of it. I got everything finished just in time for her to wear it to the local Scottish Highland Games event. We all had a great time at the Games. It was a lovely sunny day...wonderful company....good food...great music. Must be the Scots in me that makes my toe tap whenever I hear a pipe band. Kenzie must have that gene, too, because she started dancing her little baby dance when the bands played nearby. So, Mom and Dad, that's my first blog. Sorry about the pictures. I'm not much of a photographer. I definitely need to improve my skills in that area.